No, this is not Las Vegas, although the pyramids might make you think you’re looking at Vegas casino. 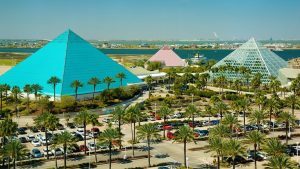 In fact, it’s a very cool museum and entertainment complex, right on the Coast, within minutes of historic downtown Galveston. Our hunt focuses the aquarium, which is first rate. Come for the fish, the sea life, the piranhas, stay for the scavenger hunt! Event Description: An attractive place for a corporate teambuilding event, Moody Gardens truly has something for everyone. Where else can you learn about animal and horticultural therapy, attend a convention, relax on a white-sand beach, explore a rainforest, and wander through one of the world’s largest aquariums – all in the same day?!! Location History: Originally designed in the mid-’80s as a center for hippotherapy (using horses as a way of treating people with head injuries), Moody Gardens has become so much more over the years. During your corporate team building treasure hunt… expect to enter a Mayan pyramid; penetrate a bat cave; count manta rays, and that’s only the beginning.